Samsung may have killed the TouchWiz UI name and instead opted to call its latest Android overlay the Samsung Experience. If you upgrade to the Android 7 Nougat beta on Samsung’s Galaxy S7 or Galaxy S7 Edge, the TouchWiz name has now been replaced by the "Samsung Experience". Samsung is jumping in with Samsung Experience model SE 8 for the new Nougat build. TouchWiz hasn’t been pushed as an official name for quite a long time, so it makes sense if Samsung is set to drop it for future products. 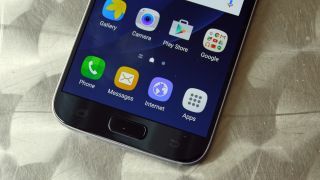 A spokesperson for the firm told TechRadar “Samsung does not comment on rumour or speculation”, but if you’ve upgraded your phone to Nougat already you’ll notice TouchWiz is out and Samsung Experience is in - what isn’t clear is whether this change will have any effect over the OS itself. For now it looks to just be a naming convention, but it may be Samsung Experience will offer a different experience on the Samsung Galaxy S8 or Galaxy S8 Edge.